Lately my mind has been on curriculum development and learning goals as I re-vamp my fall syllabi. I think I discovered a new assignment for my Introduction to Religion class. This morning, as I scrolled through the tweets on my feed, The Pew Forum (@pewforum) asked: “#Religion news junkie? 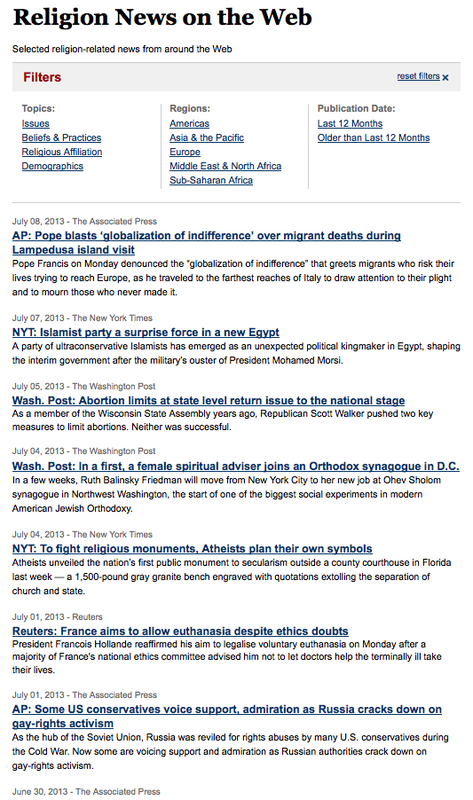 Our “Religion News on the Web” feature allows you to filter articles by topic and region: pewrsr.ch/ZNBEKX.” Perfect. In the past I had assigned students to read current events, news stories, blogs, etc. and “find” religion. Often students found the “Religion” section or blog of a popular outlet like the New York Times, or CNN”s Belief Blog, or “Religion” at the Huffington Post, all of which gave plenty of material, but, I thought, was too “obviously” religion for what I had intended and, therefore, didn’t present much of a challenge to write about. Essays would be broad summaries instead of critical reflections. Rather than fight their urge to discover “religion” [the category] by searching for the word “religion,” the Pew Forum’s “Religion News on the Web” inspired me to embrace their impulse. Here’s today’s run-down as of 10:00 AM. This work by Cara L. Burnidge is licensed under a Creative Commons Attribution-NonCommercial-NoDerivs 3.0 Unported License.